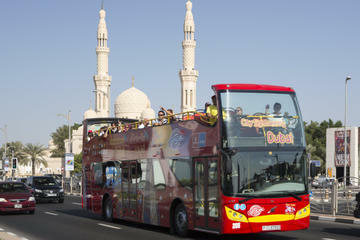 Experience the best of Dubai and Sharjah with a City Sightseeing Super Saver. Enjoy 48 hours of unlimited sightseeing by hop-on hop-off bus, taking you to more than 40 top Dubai attractions including Jumeirah Beach Park, Burj Al Arab, the Dubai Museum, Burj Khalifa, DIFC, Sheikh Zayed Road, Madinat Jumeirah, Gold Souk and Dubai Creek, plus top Sharjah attractions such as Al Qasba, the Blue Souq and Etisalat Eye of the Emirates. In addition to your hop-on hop-off pass, enjoy VIP entry to Global Village, entry to the Dubai Aquarium and Underwater Zoo, airport shuttle service, an Arabian Dhow Cruise, walking tours and more. Dubai is a city of big dreams: It holds the tallest building in the world, the biggest man-made island, the first seven-star hotel and a ski resort in the desert. Known as 'the gateway between the east and the west,' it is home to more than 2 million people of more than 200 nationalities, making it one of the most cosmopolitan cities in the world. Nearby Sharjah, known as the Pearl of the Gulf, is a fascinating UNESCO-listed cultural city with mystical-looking mosques and slick new attractions straddling both the Persian Gulf Coast and the Gulf of Oman. With this Super Saver, you can explore both cities with ease over the course of two days. Travel by open-top, double-decker bus and enjoy fantastic 360-degree views and audio commentary in 12 languages. In addition to unlimited travel over 48 hours, your ticket also includes a range of extra benefits, such as free admission to the Dubai Museum, the Dubai Aquarium and Underwater Zoo and Sheikh Saeed Al-Maktoums House, plus a VIP entry ticket to Global Village  a pairing that's offered exclusively by City Sightseeing. Buses depart every 20 or 30 minutes and run from 9am to 8pm. Extended operating hours allow you to experience Dubai at night! See below for route details. Book this combined tour and save 14% compared to booking each separately!